About seven years ago, I had a procedure in the hospital to look into some recurrent infections. The procedure showed that everything was fine and normal, and soon after my recurrent infections stopped. But while in the hospital, I picked up Clostridium difficile, a drug-resistant strain of bacteria. Since I had recently taken antibiotics for the infections, my body was primed to be taken over by c-diff (as doctors call it). It struck about a week later, while I was on vacation, and left me needing to assess the locations of all the bathrooms in every museum, restaurant, friend's home, and store that we visited. The plane ride home was also super fun. When I got home, lab results confirmed what the advice nurse and my doctor had suspected. My doctor prescribed a powerful and rarely utilized antibiotic. She explained to me that there were then only two antibiotics that could get rid of c-diff, and doctors were only allowed to prescribe them for the c-diff infection, lest the bacteria become resistant to these drugs as well (note that some people get a c-diff strain that is resistant to all antibiotics). I was on the first antibiotic for almost a month. I was lucky that it did clear up my infection and that I have not had a recurrence (which is common). But the drug made my mouth taste sour and metallic and I could only stomach eating rice and bland chicken the entire time I was on it and for some time afterwards. More significantly, for a long time after I was done with the antibiotic, I would have about 90 seconds to get to the bathroom when I realized to needed to go. Highly inconvenient for an elementary school teacher. Every ounce of flora I had developed over the last two and a half decades of my life was gone. It was about a year before I was back to reasonably normal. But my gut never completely recovered, and I now have gas and other unpleasant reactions to foods that never gave me problems before. Needless to say, it is not an experience I have forgotten. Sadly, these types of infections are becoming more and more common. In fact, the CDC reports that "antibiotic resistance has been called one of the world’s most pressing public health problems." A high percentage of hospital-acquired infections are caused by highly resistant bacteria such as methicillin-resistant Staphylococcus aureus (MRSA). In my opinion, the most unnecessary and ridiculous use of antibiotics is the practice of giving feedlot animals antibiotics daily in their feed. The Union of Concerned Scientists has estimated that 70 percent or more of antibiotics used in the United States is given to healthy chickens, pigs and cattle to encourage their growth or to prevent illnesses. Not surprisingly, "livestock producers insist that antibiotic use in animals has not been definitively linked to antibiotic-resistant bacteria that can harm people" (source). Come on. Isn't this the definition of overuse? Does it really take a rocket scientist to figure out that this practice will lead to antibiotic resistance? Does it seem like a good idea to douse animals with medication that is potentially life-saving for humans, but only if it is not overused? And here's a thought: if the conditions under which animals are being raised are such that the animals need antibiotics daily to remain healthy or grow quickly enough, maybe the conditions and/or growth expectations need to be changed. But that common sense seems to be absent from the world of industrial agriculture. Instead, we dump 24.6 million pounds of antibiotics into livestock annually to get the results we want under the conditions we want. Don't ask your doctor for antibiotics for you or your child. If you need them, your doctor will prescribe them. Even if your doctor suggests antibiotic use, ask if you can wait a few days to see if the problem resolves on its own, or consider getting a second opinion. For example, my doctor wanted to prescribe antibiotics for my child's ear infection. After consulting with a relative who is an ER pediatrician (and aware of the latest research on ear infections and antibiotics), I decided against it, at least for several more days. I did discuss that decision with my doctor, who did not oppose it. For more on children's ear infections and antibiotic use, click here. If you need to take an antibiotic, follow your doctor's instructions and finish the entire round. Make sure you consume probiotics during and after your antibiotic treatment. Throw away any remaining antibiotic in the trash (a very few communities have unused prescription drug take-back programs). Never take antibiotics that were not prescribed for you for your current condition. Stop using antibacterial soaps. There is no evidence that they kill any more germs than simple soap and water, but there is concern that they are accelerating antibacterial resistance. They also contain toxic chemicals. I would also recommend that you stop using antibacterial wipes and hand sanitizer, unless they are non-toxic and natural. Eat fewer conventional animal products. Feed lot animals (pigs, cows, chickens, etc.) 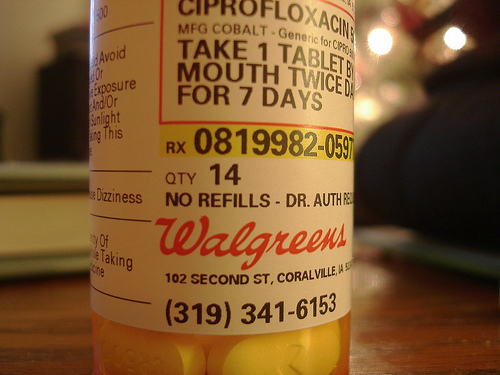 are the #1 consumers of antibiotics in the United States. If you decrease or eliminate your consumption, you are helping reduce your own consumption of antibiotics (via your food), as well as the overall amount of antibiotics dumped into livestock. Routine antibiotic use is not allowed in the production of organic food. I also survived C-diff. Mine was contracted after an extended course of antibiotics for a tooth abcess. I do have to say be careful with ear and sinus infections (both of which are my bane); as a child the doctor decided to hold off on antibiotics when I had an ear infection and it resulted in a burst ear drum. Anecdotal, but just make sure you continually monitor, and if your child appears worse, get them back to the doc right away. Good point, Tasha. Although I will add that my ER pediatrician relative told me there is no evidence that antibiotics prevent burst ear drums or hearing loss or any of the other terrible things pediatricians tell you about. But I suppose most pediatricians assume they will help prevent them or they wouldn't prescribe them. Part of my concern is that I want antibiotics to work for my child when they are TRULY necessary, so I'm not interested in using them if they are not. I'm definitely not opposed to them all together (I was very grateful to take antibiotics 2 years ago when I had a terrible bout of food poisoning while pregnant). Apparently, antibiotics are not prescribed routinely for ear infections in children in Europe the way they are here -- more food for thought. My family has antibiotic allergies so I have to be careful anyway. Thankfully my mom was a nurse and knew we shouldn't be on antibiotics unless we really needed them. I have been on every few and none for several years. Scary stuff! They are important but we need to be careful with them. I am originally from Europe. I have always made sure my daughter wore a hat when outside in cold weather. She hasn't gotten any ear infections and she is now 4 years old. I feel just horrible when I see tiny infants underdressed in cold weather and their parents dressed appropriately for the weather. I also hear a lot of other mothers at work about their kids being sick with this or that and constantly being on antibiotics. Whenever my daughter gets a cold I worry that it might be something more and do everything possible to lessen the chance of it becoming more than a cold (elevating her head when she sleeps, running the humidifier in her room, and making sure she gets plenty of fluids) including taking her to the doctors to get checked out. I'm sorry if this may sound a bit rude but I wish people used a little more common sense in preventing a child getting sick rather than just asking the doctors for antibiotics. That's why I've become so interested in essential oils. Studies have shown that they are effective against MRSA where antibiotics are not. They're also effective for earaches without any negative side effects--no wiping out the probiotics. More people need to know about this option for their health.